Kolade Olufisayo Atinuke is a postdoctoral fellow (Yam Disease Phenotyping Specialist) under the project Africa Yam: Enhancing Yam Breeding for Increased Productivity and Improved Quality in West Africa. She holds a PhD (2013) and an MSc (1995) in Genetics from the University of Ibadan and a BSc in Botany from the University of Ilorin (1989). Prior to her appointment, she worked as a Research Administrative Manager with the Africa Rice Center Ibadan station (2013-2015); and as a Research Assistant in AfricaRice, Cotonou, Benin Republic (2008-2013). 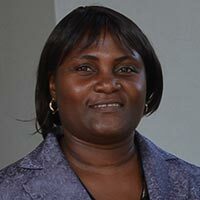 She was a Research Associate at the Bioscience Center of IITA (2004-2008); Research Supervisor at the Cassava Breeding Unit (1994-2004); Research Supervisor at the then Tuber, Roots and Plantain Improvement Program, IITA (1990-1994) and was a youth corper (NYSC) (1989-1990). She was a DSF fellow (BEST: Bourses d’échanges scientifiques et technologiques) at the Institute of Research and Development IRD, Montepellier, France (2011-2012 where she contributed to the research on the identification of a resistance gene to the Rice yellow mottle virus. She is presently an AWARD (African Women in Agricultural Research and Development) fellow.